Kochi: The driver of auto rickshaw driving past a metro pillar in Kochi was saved by a whisker. Concrete from metro pillar fell from the expansion joint from one of Kochi Metro’s pillars erected near Lisie station on Wednesday. The incident took place around 3.45 in the afternoon. Unexpectedly, concrete pieces from the metro pillar fell down towards a running auto. This sparked a fracas among commuters travelling on that road. When the incident was reported to Kochi Metro Rail Ltd (KMRL), the authorities sprung into action. KMRL has not asked Delhi Metro Rail Corporation (DMRC) to prepare a report on the incident. 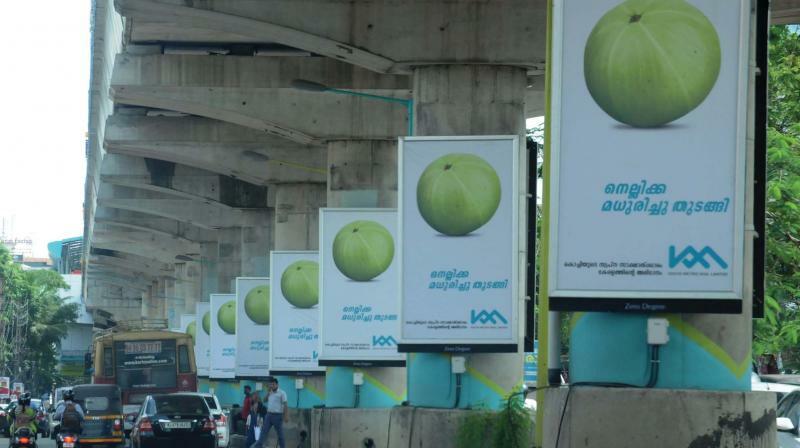 The work on this Kochi metro was taken up by them. KMRL spokesperson shares that thermocol (polystyrene) is used to fill the expansion joint. They want to know why concrete was used instead of thermocol. The Kochi metro officials are concerned as such incidents might pose a threat to pedestrians and motorists travelling on the road. It will raise safety issues for those commuting on metro corridor stretch. DMRC spokesperson on the other hand clarified that the metro pillars and structures near the station are safe. They state that it is the contractor who used concrete instead of thermocol to fill the joint. DMRC also said that they will look into the issue and then comment on it. They will find out if heavy rains caused the incident. The Delhi metro officials have also assured that ongoing work has not been affected owing to rains. The workers are working on site and cannot afford to miss meeting the schedule. This is due to the fact that the project is running behind the set deadline. DMRC wants to wrap up work for construction of cantilever bridge by next month. In case of heavy rains they will have to stop work and this will stall the progress. Work will have to be stopped till rains subside. Previous articleWas Pune Metro consultancy contract given without competitive bidding?